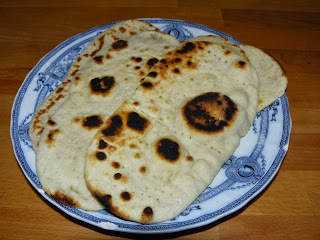 I have recently been asked to post my naan bread recipe as these are not easy to get hold of in France, but are very easy to make. We never have curry without them and tonight will be chicken and pumpkin curry night so I’ll also be making a batch of these today. See here for my curry paste recipe. I use my bread machine on the pizza dough setting to do the mixing for me. Place the ingredients in the bread machine in the order shown above and when the mixing cycle is finished put dough in an oiled bowl and cover. Alternatively mix all dry ingredients, combine oil and milk, make a well in the dry mix and pour in liquid. Slowly bring together to form a dough, knead well for 8-10 minutes then place in an oiled bowl and cover. After an hour split into 8 even balls and roll into teardrop shaped breads. Prick over the breads with a fork and either place on a hot baking sheet and grill for 1-2 minutes each side (until there are brown spots on the surface), or cook in a hot frying pan – I use my pancake pan for this. These freeze well once cooked. This recipe is taken from Anjum Anand’s book Indian Food Made Easy but slightly changed, as is my way.